PE teacher Valtteri Mulkahainen, 52, witnessed this magical moment of brown bears dancing in a circle in eastern Finland. 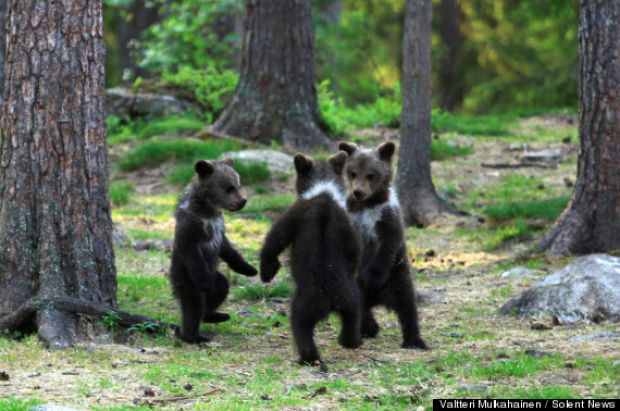 The baby brown bears in the picture were photographed holding each other’s paws and dancing in a circle by Valtteri Mulkahainen while he was traveling in Finland. The bears’ mother was watching nearby. What a life we could enjoy if we danced with our wildlife and got to know them! Instead, we are told to “let them be” so that hunters can track and kill them. They can bait them, but we should not feed them. They can run them down with dogs, but we cannot befriend or defend them. Why are we citizens so powerless? It is baffling that the Wisconsin public puts up with this violence, gaining nothing but a raped-out natural world. It will soon be time to participate in the annual Department of Natural Resources’ election, at which all citizens are entitled to elect representatives to the Natural Resources Board, which advises the Legislature. These delegates set policy governing our state parks, billions of dollars of public investment in “stewardship” lands, and wildlife. Put it on your calendar: Monday, April 14, at 6:30 p.m. in every county in the state. Eighty years of attendance by only 5,000 hunters, trappers and hounders, statewide, has stacked the deck against the 90 percent of us who want peace and safety in our state parks. One thing I have learned in three years writing this column is that people prefer good news. This is one night each year where we can create good news. Wisconsin legislators are doing great damage. They primarily care about being re-elected, so they give hunters and trappers what they want, because hunters and trappers are organized. Heck, they ARE the DNR. Legislators pretend these delegates represent all of the public. No species brings the corruption more into focus than our endangered wolves and their swift, brutal overkill. The wolf, a keystone species that keeps deer herds healthy in a state riddled with chronic wasting disease, and which is a sacred brother to indigenous people, is being destroyed as vermin. After the DNR wipes out wolves, we can take out eagles. What else is tantalizing? Tundra swans. Sandhill cranes. Seagulls. Roly-poly groundhogs. Dave MacFarland, an ecologist with the DNR, acknowledged at the Wolf Caucus that only 30 Wisconsin farms have been affected by wolves killing livestock — seven or eight of them chronically. 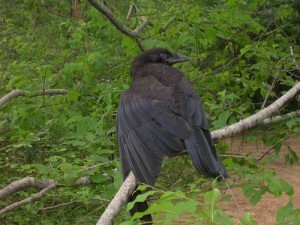 (Two or more livestock killed in a five-year period is considered chronic.) Since the delisting of wolves from the federal Endangered Species List, farmers have been allowed to kill a wolf that is attacking livestock. The federal Wildlife Service also kills wildlife for farmers using tax dollars. Wolf-killing enthusiasts have been moving through northern counties in Wisconsin gathering county resolutions to kill wolf populations down to 350. Eighteen counties have signed so far. MacFarland had started his talk by saying how lucky he feels to be working with such a magnificent species. Hackett proposed that wolf “problems” could easily be handled solely by department staff sharpshooters, with no public hunt. Wolf numbers are low and many are radio-collared and easy to find. MacFarland replied, “One of the objectives of hunting and trapping is recreation.” So much for magnificence. Come to Wisconsin to participate in dogs fighting an endangered species! It’s an exclusive market niche. DNR biologists parrot “management numbers” and “population goals” — created with input by self-serving wolf hunters. So ends 2013. Only your participation can make 2014 any different. Wisconsin should be ashamed what they have done to the wolves in this state and to their famlies, Nothing but greed to sell permits to kill these animals. And to think I always bought a wolf endangered license plate for all 3 of my vehicles and that wasn’t enough money from all the plates that were sold over how many years?????? ?where all that money go and what was it used for, sure wasn’t to protect the wolves. I am ashame to say I live in this state , Shame on WISCONSIN !!!!!!!!!! That money went to buy off bear hounders at $2500 a pop for dogs that may or may not have been killed by wolves since 1985. The whole plate thing was a scam to bribe bear hounders so that they wouldn’t poach wolves. Apparently in Wisconsin you have to pay “sportsmen” not to break the law.